Into the Light: Tina Blau, the first Post-Impressionist? Tina Blau (1845–1916), Village Landscape Before the Storm (date not known), oil on cardboard, 18.9 x 26.5 cm, Private collection. Wikimedia Commons. If painting in Germany during the nineteenth century is now a well-kept secret, the situation is even worse for Austria. Apart from Gustav Klimt, most of us would be hard-pressed to name any Austrian painter active in that century, and we are oblivious of more radical artists who preceded Klimt and the Vienna Secession. Tina Blau (1845–1916), later also known as Tina Blau-Lang, was well-supported by her family in her training as a painter. She was a student in Munich from 1869 to 1873, then at the artists’ colony in Plankenberg Castle, near Neulengbach in Lower Austria, until 1876. Tina Blau (1845–1916), Roman Capriccio with the Arch of Titus (1879), oil on panel, 12.4 x 21.7 cm, Private collection. Wikimedia Commons. She seems to have visited Italy in the late 1870s, after she left the artists’ colony. 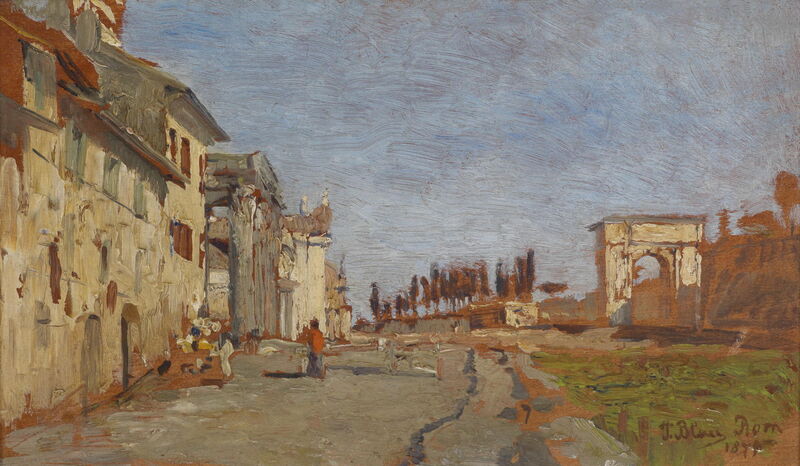 Her Roman Capriccio with the Arch of Titus (1879) is a remarkably loose plein air oil sketch of Rome. 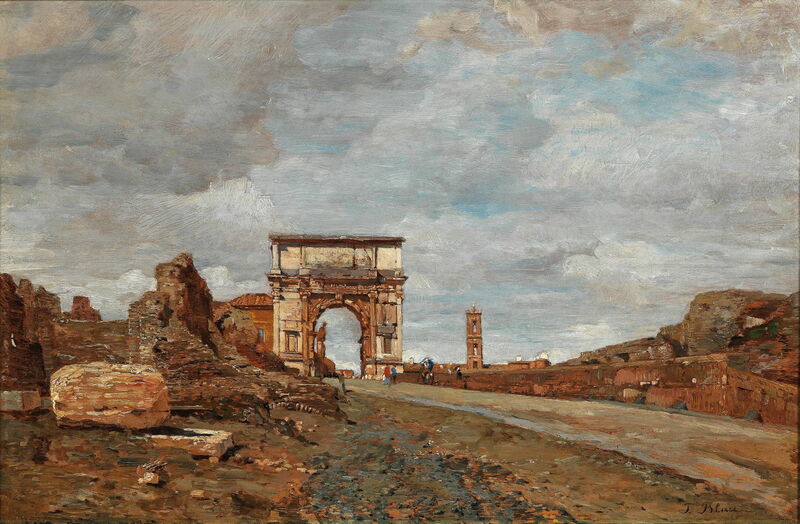 Tina Blau (1845–1916), View of the Arch of Titus Vespasian and Surrounding Ruins in the Roman Forum (1879), oil on panel, 28 × 40.5 cm, Private collection. Wikimedia Commons. Blau’s larger and more finished paintings from her early career, such as View of the Arch of Titus Vespasian and Surrounding Ruins in the Roman Forum (1879), are also impressively loose and gestural. 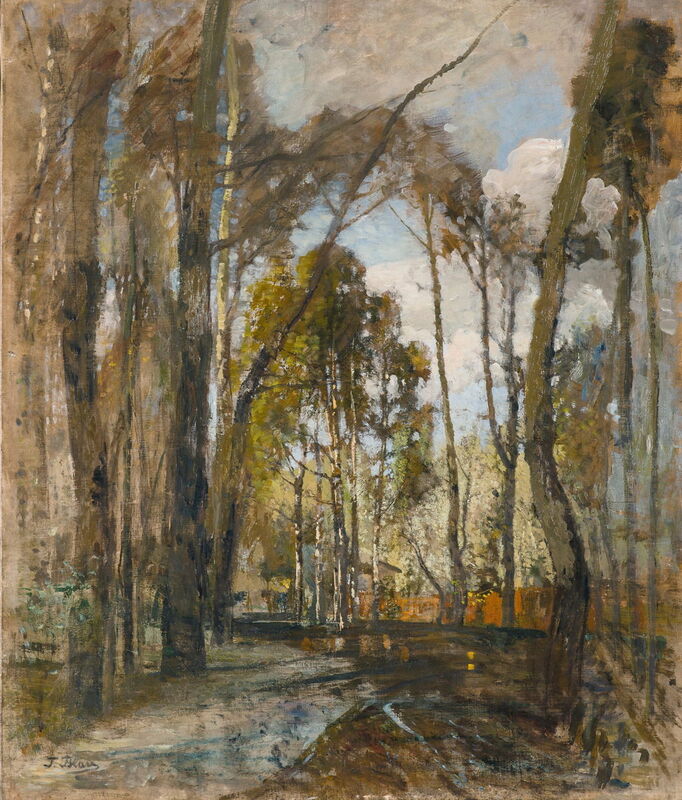 Tina Blau (1845–1916), A Lane in Italy (date not known), oil on panel, 40 x 30 cm, Private collection. Wikimedia Commons. Her highly innovative A Lane in Italy probably dates from this tour. By turning a panoramic panel on its side, she shows the narrow gash of light and humanity squeezed between tottering slums. Tina Blau (1845–1916), Spring Day in the Prater (c 1881-2), oil on canvas, 73 × 94 cm, Private collection. Wikimedia Commons. During the early 1880s, she concentrated on painting in the Prater (or Prater Gardens) in Vienna. This area of meadows and woods had been given to the public by Emperor Joseph II in 1766. In 1873, it was used for the Vienna World Fair, but hunting continued in the area until 1920. 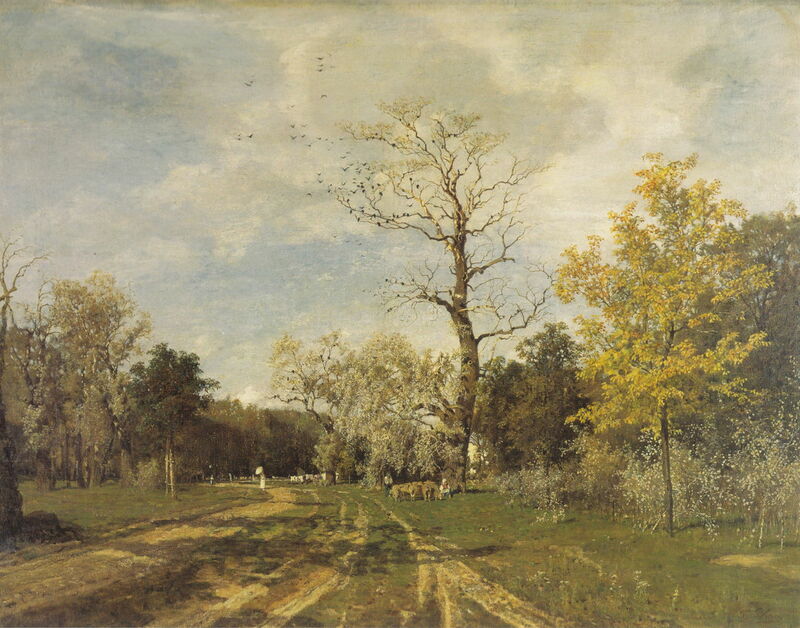 Spring Day in the Prater (c 1881-2) is one of her studio paintings from this period, with its detailed realist style. It shows the unusual combination of a flock of sheep and promenade of the fashionably-dressed. 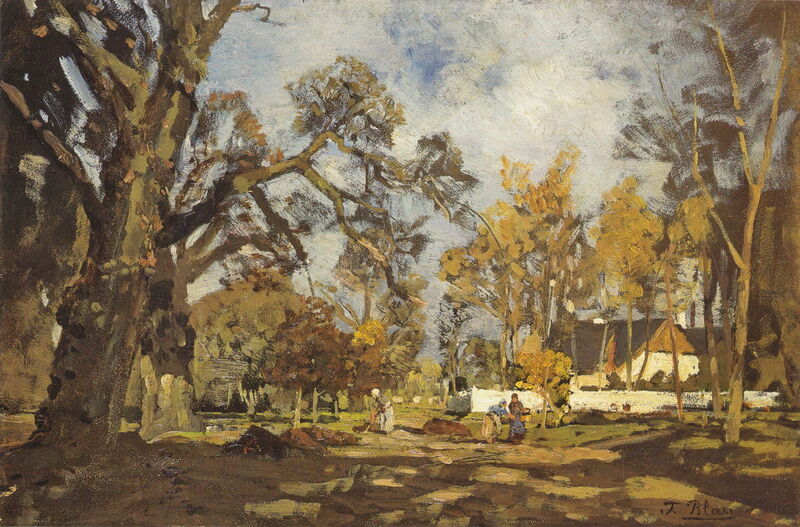 Tina Blau (1845–1916), Dairy in the Prater Gardens (1882), oil on panel, 23.5 × 23.5 cm, Museen der Stadt Wien, Vienna. Wikimedia Commons. 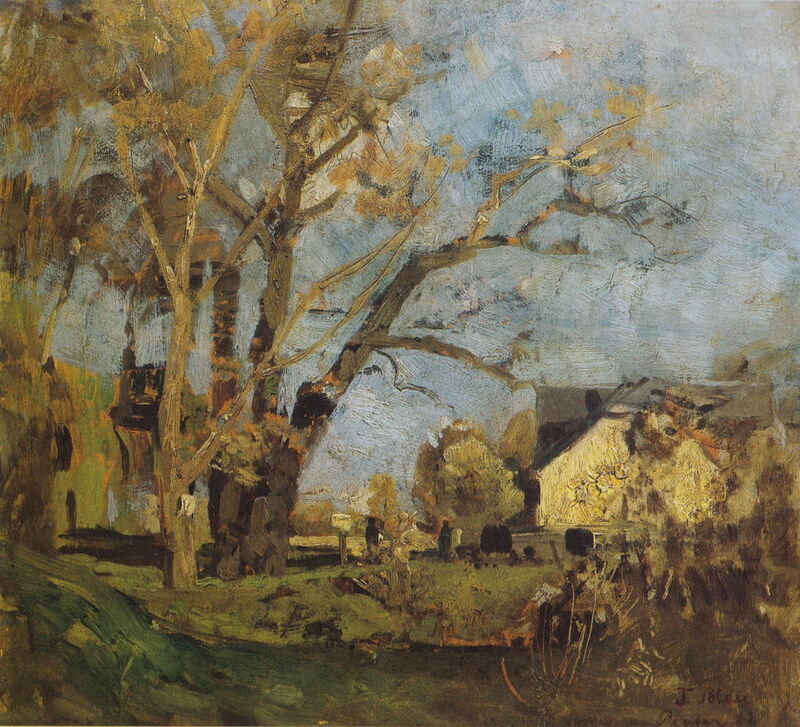 Blau’s smaller plein air sketches, here Dairy in the Prater Gardens (1882), remained very loosely executed and modern in appearance. Tina Blau (1845–1916), The Prater Gardens After the Rain (date not known), oil on canvas, 70 x 60 cm, Private collection. Wikimedia Commons. The Prater Gardens After the Rain is another plein air sketch most probably from around 1882. 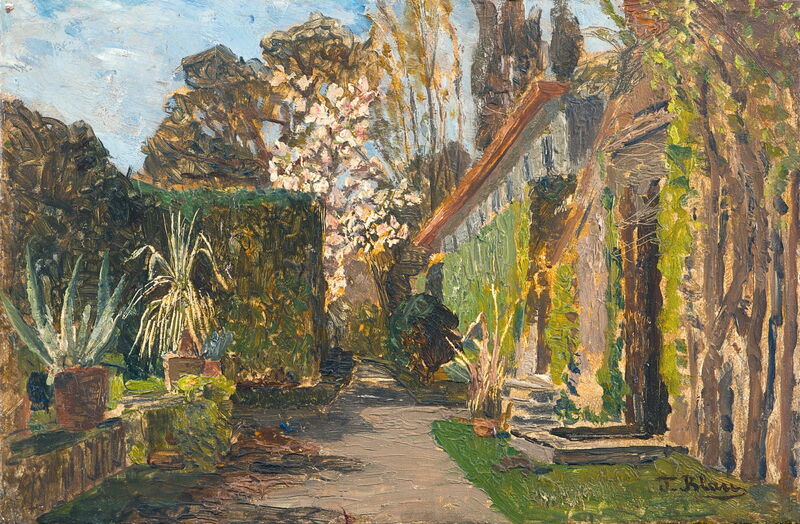 Tina Blau (1845–1916), Prater Gardens (date not known), oil on wood, 25.5 x 32 cm, Private collection. Wikimedia Commons. Prater Gardens shows the rich colours of autumn developing in the trees. Tina Blau (1845–1916), In the Krieau (date not known), oil on panel, 21.8 × 32.2 cm, Neue Pinakothek, Munich. Wikimedia Commons. In the Krieau shows an area in the Prater which is now a horse-racing track, but was clearly wooded farmland at that time. 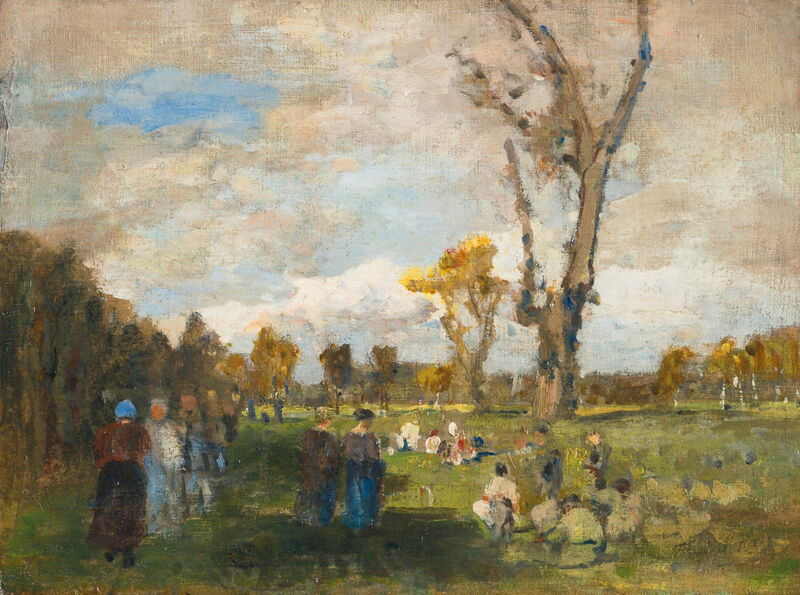 Tina Blau (1845–1916), A Summer’s Day in Prater (date not known), oil on canvas, 23 x 29.5 cm Private collection. Wikimedia Commons. 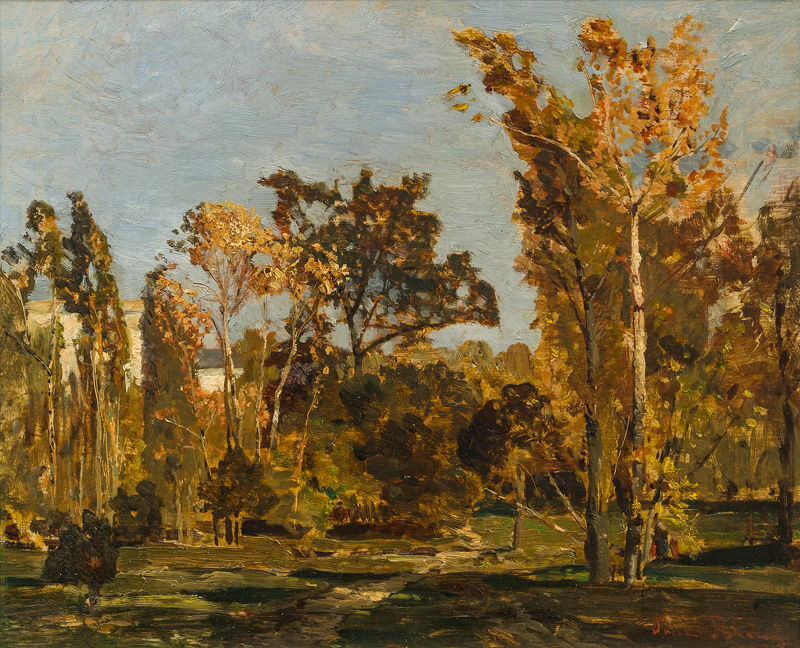 Some of her small oil sketches, such as her A Summer’s Day in Prater, became even more radical, in a Post-Impressionist style that was not seen in France until the next decade. Tina Blau (1845–1916), Sunday in the Prater Gardens (1883), oil on canvas, 24 x 32 cm, Private collection. Wikimedia Commons. 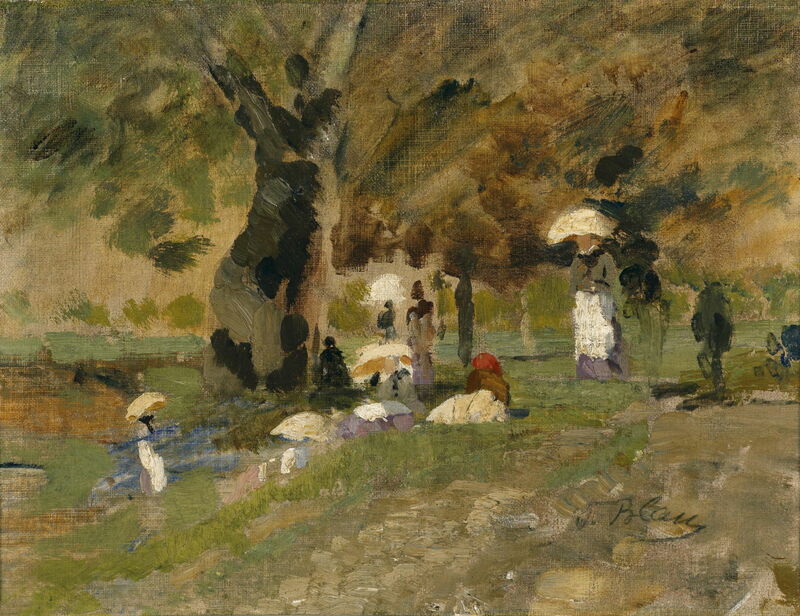 Sunday in the Prater Gardens (1883) is another good example of her quick sketches at this time. In 1883, Blau married Heinrich Lang, a painter specialising in horses and battle scenes, who is apparently only remembered now for his circus scenes. 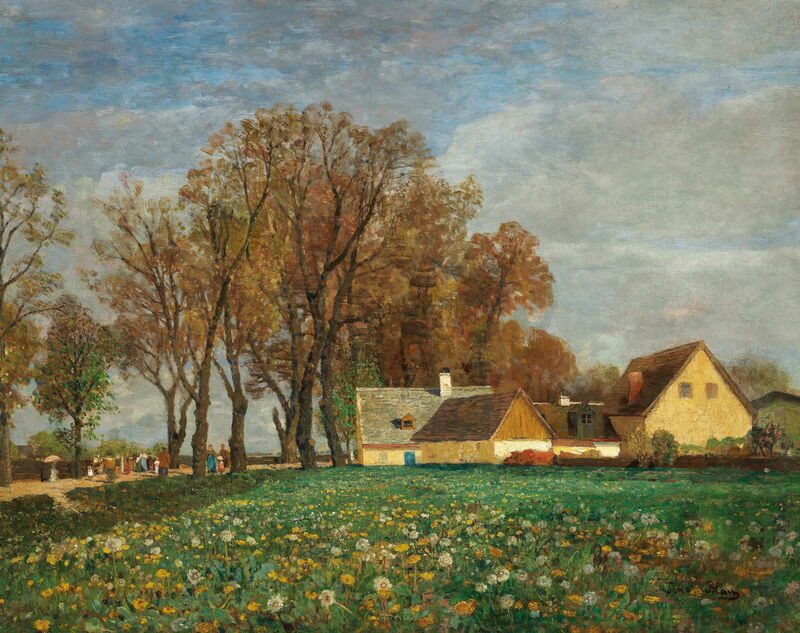 The couple moved to Munich, and from 1889 she taught landscape and still life painting in the Women’s Academy run by the Munich Artists’ Association. Her first major exhibition was held there in 1890. Tina Blau (1845–1916), On the Schleißheimerstraße (date not known), oil on canvas, 74 x 93 cm, Private collection. Wikimedia Commons. On the Schleißheimerstraße probably dates from this time, and shows the second longest street in Munich, a little over 8 km in length. This is clearly not the city end, but a studio painting which she made of the road in the countryside. The following year her husband died, after which Tina Blau spent several years travelling, mainly in the Netherlands and Italy. Tina Blau (1845–1916), A Mediterranean Garden (date not known), oil on board, 17.5 x 27 cm, Private collection. Wikimedia Commons. A Mediterranean Garden may have been painted earlier, around 1879 perhaps, but its thick application of paint suggests that it dates from this period travelling after her husband’s death. Its facture is more like a work from the twentieth century. 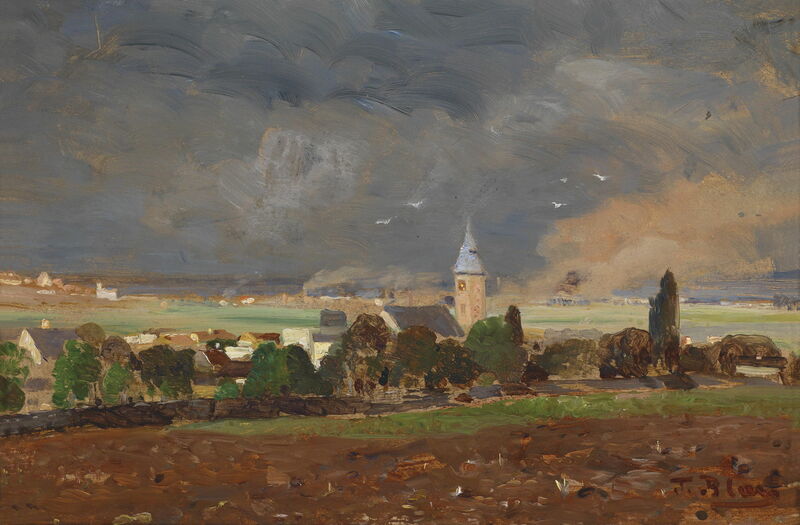 Village Landscape Before the Storm is a plein air oil sketch of Heiligenstadt under a very dramatic sky, and was probably painted in the mid 1890s. Heiligenstadt is now an integral part of the city of Vienna, but remained a separate town until 1892. In the summer months, it was popular with tourists: one visitor in 1802 was Beethoven, when he was coming to terms with his worsening deafness. 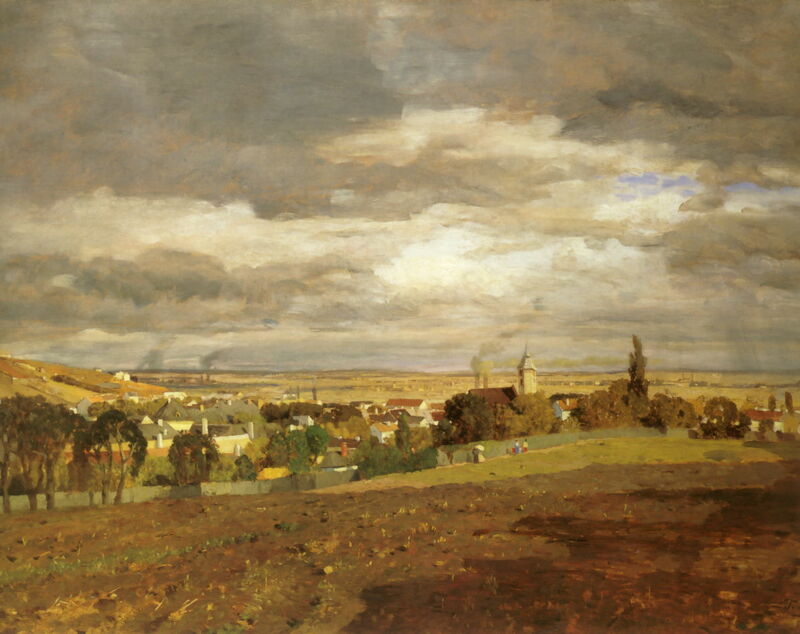 Tina Blau (1845–1916), View of Heiligenstadt (1893-7), oil on panel, 41.5 x 58.1 cm, Private collection. Wikimedia Commons. From that sketch, and presumably other studies, Blau developed this finished studio painting, her View of Heiligenstadt (1893-7). In 1897, Blau returned to settle in Vienna again, where she established her studio in the Rotunde, a circular steel building which had been erected in the Prater at the centre of the Vienna World Fair in 1873. Together with Olga Prager (1872-1930), Rosa Mayreder (1858-1938), and Karl Federn (1868-1943), she founded the Vienna Women’s Academy of art, and taught there until 1915. 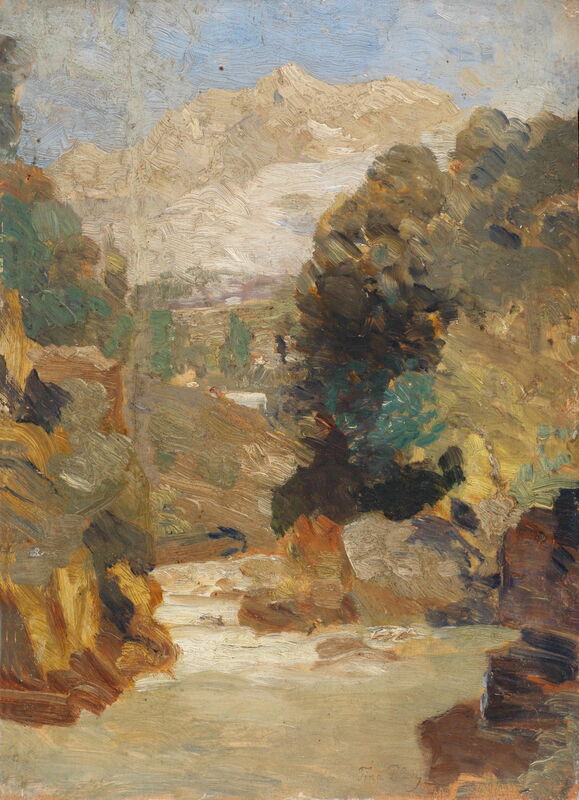 Tina Blau (1845–1916), Schladming (1902), oil on wood, 33 x 23.5 cm, Private collection. Wikimedia Commons. Blau must have visited the mountain resort of Schladming, where she sketched this mountain and water view in 1902. 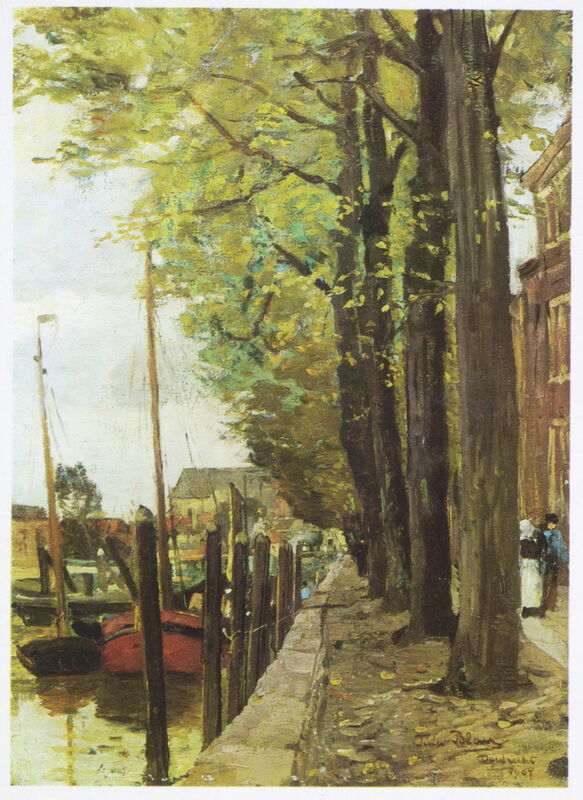 Tina Blau (1845–1916), Dordrecht (1907), oil on canvas, 39.5 x 29 cm, Private collection. Wikimedia Commons. She may have visited this old city in the western part of the Netherlands during the early 1890s, and returned to paint Dordrecht in 1907. In 1915, her health started to cause concern, so she stopped teaching and went to a sanatorium, where she died in 1916. Posted in General, Painting and tagged Austria, Blau, Blau-Lang, Impressionism, painting, Post-impressionism. Bookmark the permalink.